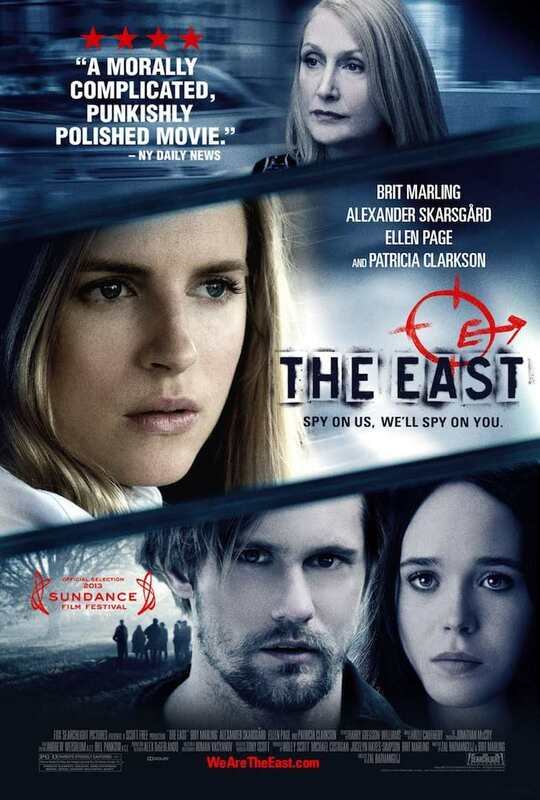 “The East” represents an independent, suspenseful and a sort of espionage thriller from acclaimed scriptwriter and director Zal Batmanglij and his dearest friend and co-worker, screenwriter-actress Brit Marling playing a former FBI agent and now a private spy - Sarah Moss. Moss has an additional job at Hiller Brood, an aristocrat-focused security firm that ruthlessly conserves the secrets of its A-list corporate clients. Handpicked for a prize chore by the company's chief, Sharon (Patricia Clarkson), Sarah goes undercover to permeate “The East” – a dangerous radical group of eco-terrorists who aren’t afraid to go a bit too far in expressing their point of view. Decisive, highly-qualified and clever, Sarah quickly ingratiates herself to the family of close friends covered by the title “The East”, overcoming their incipient feelings and joining them during their “jam” activities – punishment sessions operated according to the “eye-for-an eye” philosophy. Only sustenance closely among the intensely dedicated elements of “The East”, Sarah discovers herself torn between her mission and growing feeling to the extremist’s guru Benji (Alexander Skarsgard). Her choices will become more dangerous and uncontrolled as well as her relationship with her employer and new friends from “The East”. "The East" premiered on January 20, 2013 during the Sundance Film Festival and was released internationally on May 31, 2013.